I just received a free copy in the mail (thanks Doubleday!) of what is truly a momentous publication: the new Catholic Bible Dictionary, edited by Scott Hahn (Doubleday, 2009), and running at almost 1000 double-columned pages. It's fantastic. From this day forward, I will be making this volume the first book that all of my students purchase. In addition to having everything you usually expect from a Bible dictionary (names, places, maps, definitions, etc.) here are just a few of the reasons everyone--both Catholic and Protestant Bible students--should consider this a must-own. It's Catholic. There are literally dozens of Protestant and ecumenical Bible dictionaries, but this is the first uniquely Catholic Bible dictionary to be published in almost 50 years! (In English, at least). The last was written by the Jesuit John L. McKenzie in 1965, compiled on 3-by-5 notecards! (I knew one of his students.) This one has Scott Hahn as its general editor, and Scott's unique mastery of Scripture and theology shows on every page. As such, it is a unique compendium of treatments of biblical topics from a distinctively Catholic perspective, in a concise format packed with data. If you're a Catholic or Protestant whose ever wondered about the biblical bases for distinctively Catholic beliefs, then this Bible Dictionary is a one-stop-shop that contains references and arguments you simply won't find in any other Bible dictionary in print (including McKenzie). See, e.g., the articles on "Mary," which goes through the biblical evidence for Mary as the Ark of the New Covenant, Queen Mother of the Davidic Kingdom, the New Eve, and a Type of the Church. Other examples are the articles on the biblical bases of "Papal Primacy," "The Eucharist," "Purgatory," the "Canon," etc. It's Packed with Information, including Long Articles on Major Subjects. This is no tiny pocket dictionary; again, it runs almost 1000 pages, double columns. One of the frustrations I have with many Bible dictionaries is that there's either too little information or more than you want (e.g., sometimes the ABD). This one's just right. It's meaty without being intimidating. I especially love the long articles on major subjects; they really are extremely well done and allow a person to dive in deep without being overwhelmed with data. This is a sign of a great editor--knowing when to keep short what needs to be kept short and when to give space to issues that need a fuller discussion. See, for example, the fantastic articles on "Biblical Criticism," "Inspiration", "Interpretation of the Bible," "Sacrifice," "Temple." The articles on "Covenant" and "Inspiration" are phenomenal, and worth the price of the whole book. It Successfully Integrates Scripture and Theology. In the biblical guild, there's a whole lot of talk about "bridging the great divide" between biblical studies and dogmatic/systematic theology. But we still tend to keep producing Bible dictionaries without much theology and Theological dictionaries without much Scripture. Not so with the Catholic Bible Dictionary: it integrates the two seamlessly and authentically, in a way that is both refreshing and (in my humble opinion) way ahead of its time. Again, check out the articles on "Inspiration," "Jesus Christ," "Temple," and "Typology" for a taste of this. I could go on and on here, but I've got to go to bed. 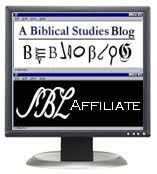 I hope this little bit whets your appetite for purchasing the Catholic Bible Dictionary. I haven't been this excited about a resource that I could both learn from myself and use with my students in years. God bless Scott Hahn for putting this thing together. Oh, and one final plus: it's got a stinking gorgeous cover (kudos to the Doubleday cover art team!) and a great layout--it's 1 and 1/2 spaced, so no eye-headaches like most Bible dictionaries. It's actually pleasant to read this thing, which I can't say about most of my Bible dictionaries, which go right back on the shelf as soon as I'm done with them. If you've ever wanted to understand what the Catholic Church really teaches about Sacred Scripture and what a truly Catholic biblical theology really looks like, then this is the Bible Dictionary for you. I've had my eye on this since I first heard about it a couple of months ago. Thanks for the brief review. I'll definitely be picking a copy up. Michael Barber recommended this to me a few weeks ago, and it has been on my "to purchase" list. Thank you for your review . . . I am not going to put off buying it any longer! This volume is a must-own for any Catholic doing Bible study. Brant is absolutely justified in his praise of this work. In fact, I'm using it as a textbook for the OT class I'm teaching. Among other things students are required to read the entries for each of the OT books and categories of biblical literature (e.g., wisdom, apocalyptic). I'm also having students read other articles on key topics such as Biblical Criticism; Covenant; Family; Inspiration; Jubilee; Kingdom; Law; Liturgy; Marriage; Messiah; Parousia; Priest, Priesthood; Prophet; Sacrifice; Temple; Typology. Hmm, I'll have to see. I'm pretty enamored of McKenzie's. I know that this is an old post so I don't know if you will see it but here goes. I was going to buy this dictionary but the cost plus shipping to Australia gave me pause. I went to Amazon and one of the reviews criticises the book because it cites no references. Is this true and if so, does it matter and why not?